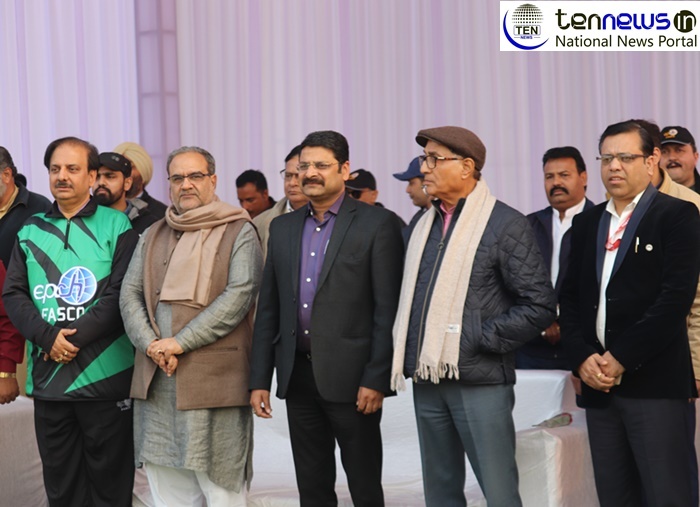 Moradabad, (24/12/2018): On a sunny winter afternoon, key exporters from Delhi and Moradabad gathered togethered on a lush green Moradabad pitch to enjoy a well-fought match of India’s favorite sport – Cricket. On Saturday, a cricket match was played between Delhi and Moradabad at Teerthankar Mahaveer University, Moradabad. It was organized by the Export Promotion Council for Handicraft Fitness and Sports Committee ( EPCH-FASCO). Exporters from Delhi and Moradabad region were there in both the teams. EPCH has been doing a wonderful job for the welfare of the handicraft exporters. By providing them with the best of opportunities and giving them a platform on which the exporters can showcase their skills and products. The event was attended by Bhupendra Chaudhary, Panchayat Rajya Mantri, UP, and Ritesh Gupta, MLA, Moradabad Nagar, as the chief guests. EPCH ED, Rakesh Kumar and EPCH Chairman, OP Prahladka also graced the event with their presence. The event started traditionally by lighting the lamp. And afterwards the cricket match was played. Moradabad won the toss and elected to bat first. While batting first, they scored 169 runs in 20 overs. Chasing 170, Delhi team played better than the Moradabad team and achieved the targets with 5 wickets in hand. Two fifties were scored in the match by players of both the teams. Delhi team played the youngest player of the match, a 15 year old boy named Priyanshu, who took 3 crucial wickets of the Moradabad team. However, the match was won by Delhi team, but as the commentator said, “this match is not just a match of cricket, but it is a match of love”. Both team players were extremely happy and played the match with a true sportsmen spirit. After the match was played, EPCH inaugurated an upcoming event “Run for Unity”. EPCH also presented guests and members of the EPCH with mementos. An interactive session was also organized between Rakesh Kumar, ED, EPCH and the students of the ‘CHEMS’ – a program started by the EPCH. CHEMS, stands for ‘Center for Handicrafts Exporters Management Studies’. Talking to Ten News Rakesh Kumar ED, said, EPCH always try to give the exporters, the environment like home. This match will make the relation of the exporters of both the region more strong and they will get to know each other better.Talking about the ‘CHEMS’, he said, it was started to provide the small exporters and entrepreneurs with a platform to learn the basic skills of doing exports and maintaining their business. OP Prahladka, Chairman, EPCH also interacted with Ten News and said, “this match is not a competition but it is an opportunity provided by EPCH for the players of both the team to get comfortable with each other and get to know each other”. He further added that whoever wins they both are winners because they are getting the platform to showcase their skills on the field and off the field. #Live: #AAP Gopal Rai Addressing Media At Aam Aadmi Party Head Office!